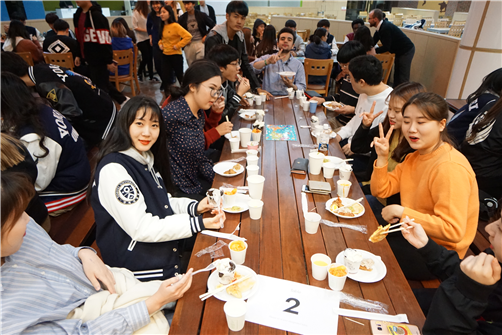 Every semester, Appenzeller House cooperates with Underwood Global Community to bring about the International Potluck, a celebration of cuisines from any corners of the world. Furthermore, the International Potluck aims to strengthen the bond between the RC students, RAs and the professors. At the same time, RC students are encouraged to utilize the dorm facilities to cook more often. As of 2018 Fall semester, the Potluck took place on October 5th. Even though the Potluck itself was a two-hour event, the chefs actually devoted many hours before the feast to prepare the dishes. 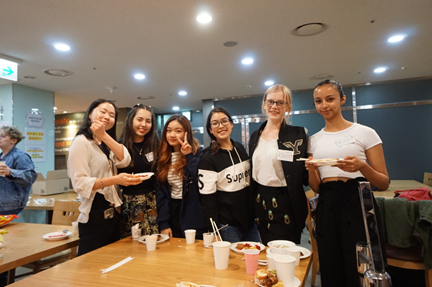 Over 100 students came to enjoy the dishes prepared by almost 50 cooks who were also Appenzeller House’s students. During the event, students got engaged in many different small activities. Zellers were actively participating in the interval game which was bingo around the topic of names of countries around the world. They were enjoying their foods and good music while conversing with each other. At the end of the event, votes were cast to choose the best dishes. The potluck was a success since everyone left with a full stomach that was filled with amazing foods from all over the world.